What are queues and queue settings and how do they work? From the Code Review dashboard you can see two different queues: your Help Queue and your Grading Queue. Help Queue: Messages that students send in the "Help" tab in the code editor are automatically sent to your Help Queue. By clicking on a help message, you'll be taken to the Editor page for that exercise. From that page you can view the student's question through the "Help" tab and write a response. You'll also be able to view their code and run the program to help provide more information and background on the question they might be asking. Grading Queue: Your grading queue is the list of student exercise submissions waiting to be graded. 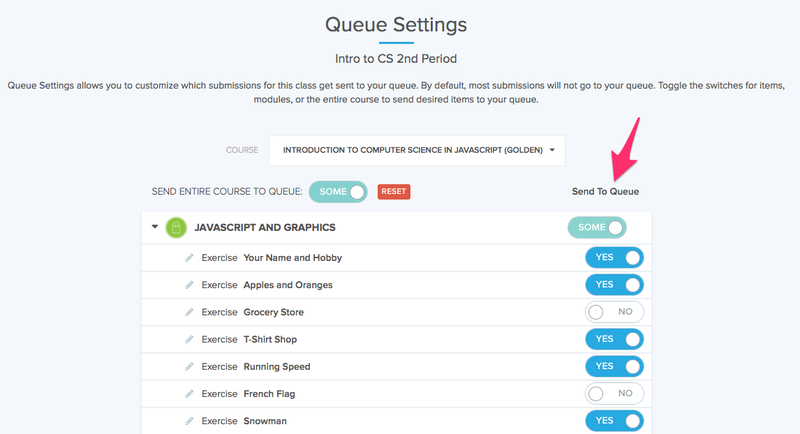 Each course has a default set of exercises sent to the queue, but you can customize which problems go to your queue from the Queue Settings page. You can also use Grade Mode and Fast Grade to help you work through your grading queue more efficiently. Through Queue Settings, You can also choose what you grade, and prioritize giving feedback to exercises that are most relevant to your class. From here, you can decide which exercises get sent to your grading queue by toggling "Yes" or "No". You change settings for individual exercises, modules, or the entire class at one time.